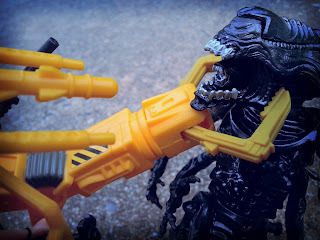 If you didn't see the first part of my look at Kenner's Aliens line (in which I focused on the Xenomorph figures from the first wave), check it out here: Barbecue's Show & Tell: Aliens part 1. Ok, so now that we're on the same page let's look at the Space Marines from the Aliens toy line. 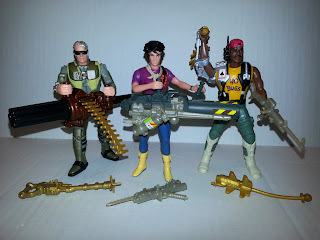 Looking at these figures which are largely based on the 1986 film Aliens but that were released in 1992, you might wonder what exactly Kenner was aiming for. While Ripley is certainly in the line, it also featured characters like Apone and Drake (who died in Aliens), Hicks (who died between Aliens and Alien 3), and Bishop (who gets scrapped in Alien 3), so one has to ask when exactly was this line set? Take another look at character design elements like Bishop's sunglasses and Apone's mechanical arm and you'll wonder if these were based off of a Saturday morning cartoon that you just can't seem to remember. Well, it turns out no one remembers because it was never released. There were, however, plans for an animated series called Operation: Aliens. No one knows much about it and only a few production still exist, but it looks like it could have been awesome. Now that you know why we have such crazy redesigns for some of the characters, let's take a look at the Space Marines after the break! Not only is she the main character of the Alien films (played by Sigourney Weaver), but she's also one of the greatest female characters of all time. The figure might pass the squint test (if you squint, you'll think it's Ripley) but honestly, I like the sculpt. She manages to look feminine while still capturing the strength of the character, something not seen in many action figures of the early 90's. Her outfit's pretty cool (I've always liked the magenta shirt with a bandolier) and she's nicely armed. With a small rifle and a flamethrower. The small rifle can, believe it or not, be attached to Ripley's back and has a huge bayonet mounted on the end. The flamethrower might be the coolest accessory in the line: the fuel tank is removable and the translucent flame can move in and out. The gun fits in Ripley's hands and has a small peg that fits into a holster on Ripley's thigh, so when turn Ripley at the waist the motion causes the peg to move the flame in and out. He still only moves diagonally. Played by Lance Henriksen (one of two actors who has been killed onscreen by an Alien, a Predator, and a Terminator), was an android that pretty much just looked like a normal guy. That wasn't enough for Kenner, though, and so Bishop was redesigned with a bald, robotic head and some wrap around sunglasses which he always wears (even at night). In fact, the portrait on the bag of the card looks like someone just drew sunglasses and a metallic head over a picture of Lance Henriksen. It's really weird. As a figure, Bishop is outstanding. 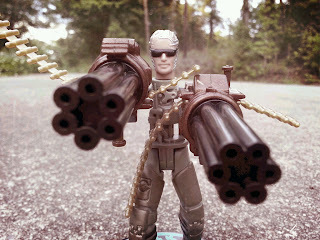 First, he comes with an incredibly cool Gatling gun. It features a removable ammo belt and a knob that causes the barrels to rotate and the ammo belt to be fed through the chamber. Secondly, his backup weapon is a really neat idea: a massive cattle prod with spikes on the end. It easily snaps onto his back for storage and seems like something that might be an effective weapon for fighting Aliens. Lastly, Bishop features the ability to split apart at the torso so you can recreate scenes from the end of Aliens. The left and right halves of his torso are a shell that fits over his robotic innards and the pegs that hold the torso halves on can also be used to attach his Gatling gun to his body, turning Bishop into a mobile gun turret. Not only was Sgt. Apone a cool figure, but he also filled in as Mr. Ray Arnold (Samuel L. Jackson's character) when I was playing with my Jurassic Park figures. Played by Al Matthews in Aliens, Sgt. Apone is the tough and no nonsense leader of the Space Marines. Apone's manner of dress makes him look like he'd be more at home with the G.I. Joe team (he always reminded me of Heavy Duty) as he's wearing a yellow sleeveless t-shirt, a backwards ball cap with a headset, and is sporting a mechanical arm. According to the mini comics, I think the mechanical arm was the result of some alien attack. 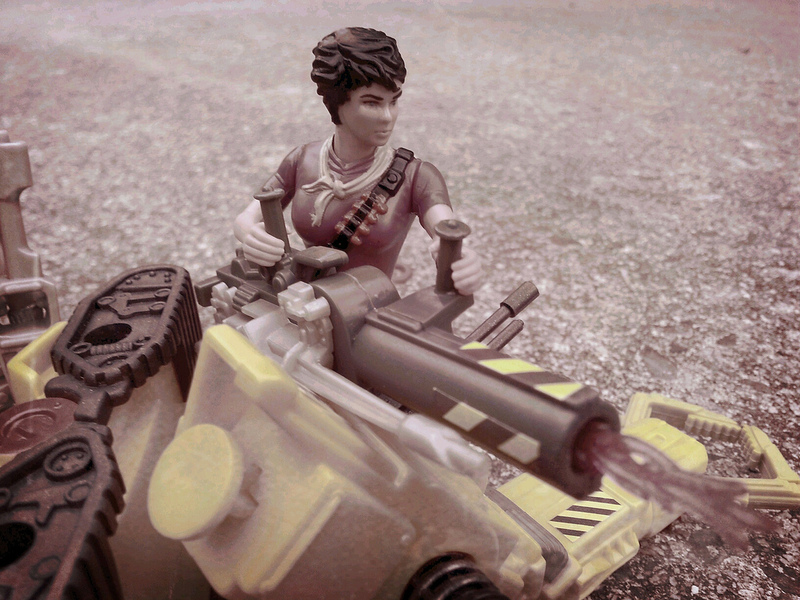 Apone is armed with a nice rifle that can attach to his left leg and two giant grenades that can attach to his back. They're rubbery and can fit into his right hand. 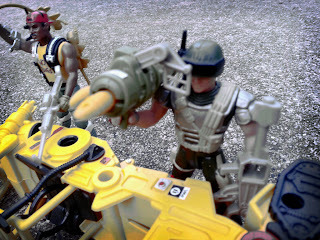 The idea is that you have Apone hold a grenade in his right hand and pull back on it. The combination of the stretchy material and Apone's spring loaded waist cause him to hurl the grenade with varying degrees of success. While he's the most standard military looking figure in the line, he's also the dullest. Based off of Michael Biehn's character in Aliens, Hicks's outfit certainly does bear a decent resemblance to the Space Marines' outfits from the film. While his claw arm is kind of bizarre (if you turn it around it looks more like a gun) his rocket launcher is really a nice piece of equipment. Not only is it reasonably sized (and not ridiculously huge like most action figure projectiles) but it looks like an actual piece of military equipment, can store the second missile on the side, and fires when you press the aiming reticule down. 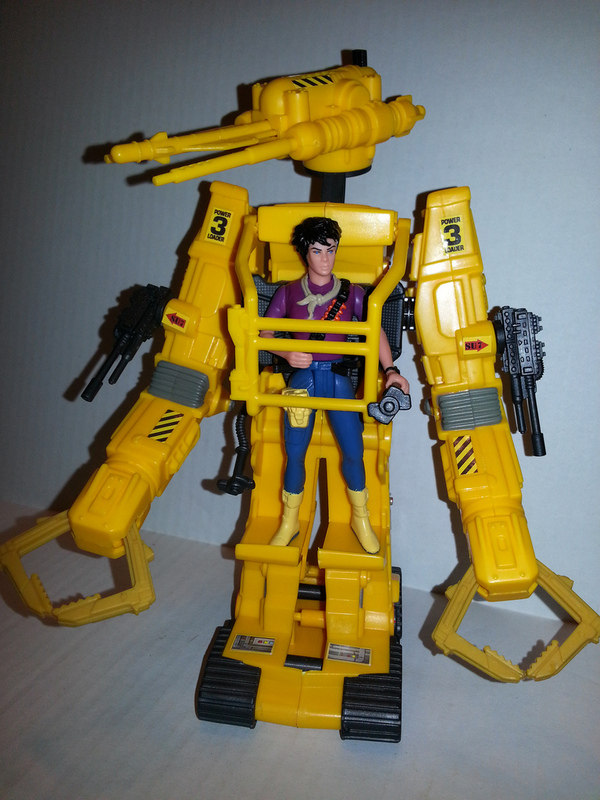 Definitely one of the coolest and most movie accurate vehicles of the early 90's, the Aliens Power Loader very nicely replicates the look of the film version but features some extra armaments to better aid in killing aliens. Besides the working claws on each arm, the arms are also equipped with pivoting machine guns on the shoulders and a pivoting gun turret with a launching missile. It's not as accurate as the Hot Toys version, but it's still a pretty impressive plaything. One of the best things about the Aliens figures, at least to me, was that each figure actually came with what appeared to be functioning weapons. 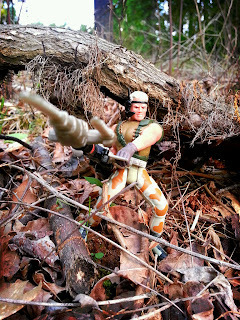 While Kenner's Jurassic Park figures often came with lassos, water guns, and net launchers, the majority of the Aliens figures came with weapons that seemed like they could do some real damage. Even Apone's giant grenades looked dangers, kind of like the spiked grenades from Gears of War. The stickers were also a unique concept as well as they gave you the opportunity to really detail your figure without having a preset pattern. Some of the weapons really pop when they have a few nicely applied decals on them. 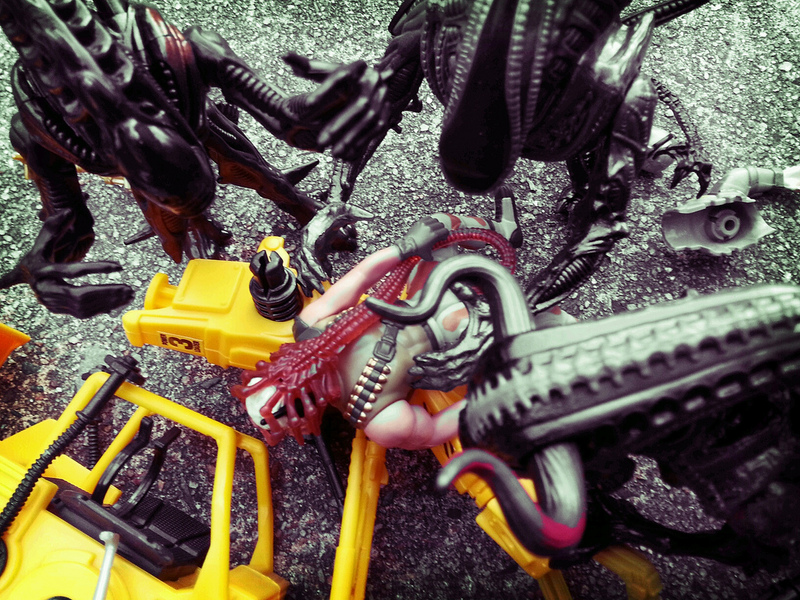 I had talked about my friend Freddy in my first article covering Aliens, and I do have a few more stories to tell about our experiences of playing with the Aliens. Since Freddy had seen the movies and I hadn't (you do remember telling you that Freddy was cool, right?) he guided most of our encounters. 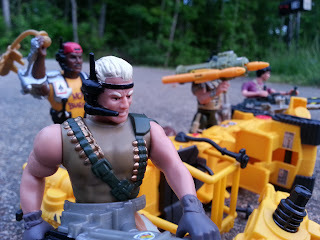 Of course we needed more Marines, so Freddy began taking other random action figures (Ninja Turtles, X-Men characters) and taping name tags around their arms so we knew who they were. We had a Hudson, Vasquez, and Frost, although they looked a lot like Leonardo, Panda Khan, and Sabretooth. We also had a very cool deep dive Batman to whose hands Freddy taped small nails to, effectively giving him claws. he always survived our Alien encounters. I still remember the day Freddy sold me that Batman, although my mom made me take the nails off because she was afraid I might get tetanus. 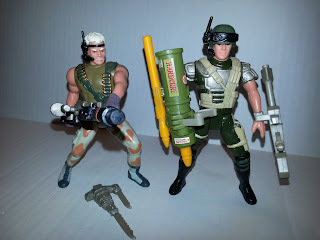 Kenner would eventually release one more Space Marine in the US and three overseas in the main Aliens line, although these guys would later make their way to Kay-Bee toy stores in the late 90's. I'm still working on tracking all of those guys down, but be assured that when I do, they'll make it into Show & Tell. Barbecue17 once tried to duct tape tent pegs to his hands, effectively giving him claws. His wife made him take them off, however, claiming he'd get tetanus. He may have pictures of this on his Flickr account (but probably not). Just found this by accident. What? No coverage of the other ones? I think there was Vazquez....2 more. Did they make it to the states or not? Yes, there were others including Atax (a guy who wore an alien disguise), O'Malley, Vasquez, and Hudson. I have Atax and Vasquez so they'll probably get covered at some point. Atax was released in series 2. The other three were released in very limited limited numbers in the US originally (they mostly were released in Europe) but did see wider release as KB toys exclusive repaints. I have the KB Vasquez.